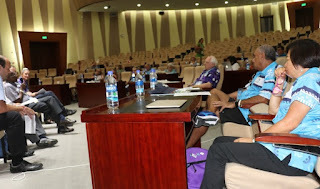 West Papua is one of the countries that could be included in future Pacific Games as the Pacific Games Council (PGC) continues to discuss ways of being inclusive of all the countries within the region. The other names that were floated in general discussion that could be invited to become members of the regional games were Christmas Island, Bouganville, Easter Islands and Hawaii apart from Australia and New Zealand. These countries couldin future become associate members with certain voting rights. A couple of countries were a bit weary of Australia and New Zealand becoming full members, as they could dominate the Pacific Games. Australian Olympic Committee member Helen Brownlee said that Australia was sensitive to the sentiments of the islands and would only enter sports where the islands were strong in such as weightlifting and rugby 7s. “We will definitely be sending teams to the 2019 Games in Apia but it’ll depend on the individual federations. “We have to go back to our sports for 2019. Athletics said no because standards not high. “This time we sent a development team,” said Brownlee. The PGC Forum also discussed its bid process and management structure regarding terms of office bearers. Members were satisfied with the current arrangements of seven years for bid process and terms of officials in office. PGC president VidyaLakhan felt he’s been in the job for too long having now over ten years but members said there is a democratic process in place and if office officials don’t perform they are voted out. Members felt the PGC president is doing a good job.